Dental care is important for your child’s overall health and wellness, which is why you might be concerned about packing tooth-friendly foods with their daily lunch. Although it might seem difficult to find foods that are just as healthy for their dental enamel and gums as they are for their body, the packing process doesn’t have to be intimidating—especially if you know what to look for. Here are a few great lunch ideas to protect your child’s dental health, along with some ideas for those after school snacks. For a tasty meal that will fill up your child, pack a toasted whole wheat bread sandwich finished with mustard, mayonnaise, and lean chicken. Meals high in protein give your little one energy throughout the day, in addition to helping their body to rebuild cells and develop muscle. Additionally, whole grains act as a natural abrasive, rubbing away plaque and food particles. Salad is rich in Vitamin C, Calcium, folic acid, and Vitamin B, helping your child’s body to remineralize areas of dental enamel that have been damaged by bacterial acids. Adding protein like grilled chicken gives your child energy and helps their body to stay strong and healthy, and toppings like cheese, light dressings, and veggies help to keep the teeth clean and strong. To combine the taste of delicious meats with the health benefits of leafy greens, make turkey roll-ups to put in your child’s lunch. 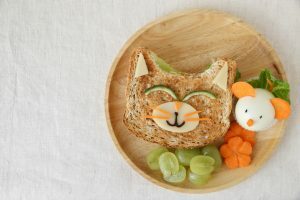 By scrunching up some lettuce and veggies, wrapping a slice of turkey around it, and securing the entire bundle with a thin slice of carrot, you can create a fun-to-eat lunch that is incredibly healthy for your child’s teeth. Carrots and celery are naturally fibrous, allowing them to act like a miniature toothbrush as your child munches away. Offer carrots and celery sticks after school, or keep some fresh sticks in a plastic bag for a quick snack on the go. Eating apples has been shown to increase your saliva levels, while simultaneously scrubbing away plaque and food particles. Although apples are naturally sweet and refreshing, they are much lower in sugar than other fruits, helping to ward off dental decay.